November 1943May 1945The U.S. Army Air Forces waged an unprecedentedly dogged and violent campaign against Hitler’s vital oil production and industrial plants on the Third Reich’s southern flank. Flying from southern Italy, far from the limelight enjoyed by the Eighth Air Force in England, the Fifteenth Air Force engaged in high-risk missions spanning most of the European continent. The story of the Fifteenth Air Force deserves a prideful place in the annals of American gallantry. 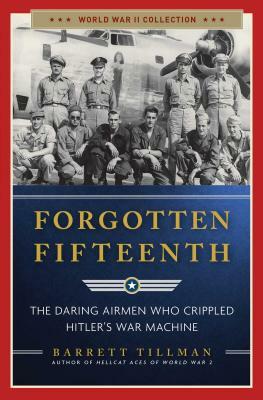 In his new book, The Forgotten Fifteenth: The Daring Airmen Who Crippled Hitler’s War Machine, Tillman brings into focus a seldom-seen multinational cast of characters, including pilots from Axis nations Romania, Hungary, and Bulgaria and many more remarkable individuals. They were the first generation of fliersfew of them professionalsto conduct a strategic bombing campaign against a major industrial nation. They suffered steady attrition and occasionally spectacular losses. In so doing, they contributed to the end of the most destructive war in history. Barrett Tillman is the author of Whirlwind in addition to more than 40 books and 550 articles. He is a familiar television commentator with over a dozen credits on The History Channel and National Geographic Channel. The Wall Street Journal hailed him as "a master story teller," and Pulitzer Prize-winner Stephen Hunter called Whirlwind "a miracle of military history." Tillman's work has been cited in dozens of history books and has been used as course work by the Air Force, the Navy, and Marine Corps. Barrett Tillman lives in Arizona with his wife Sally.